Heart Dog a Book by Roxanne Hawn - Order Your Copy Now! Canine soul mates may happen just once in a lifetime. With such great love comes epic grief after your Heart Dog dies. Even if you’ve experienced pet loss before, life without your canine soul mate is much harder. Typical grief advice isn’t enough. Sometimes challenging traditional thinking about grief, Heart Dog answers all the big questions about canine soul mates, offers practical ideas for coping with each day’s dose of grief, and provides inspiration for finding your place in the world after such a profound loss. Strategies and insights come from the author and 500 people who participated in an online survey. Others have survived the grief. You can too. Let Heart Dog be your guide. Order Books in Bulk (50% discount) ! OR Buy NOW from These Online Retailers! Praise for Heart Dog ! “Honest, concise, and ultimately hopeful, veteran author and dog-lover Roxanne Hawn has transformed the deep pain of losing her canine soul mate Lilly into an empathetic guide that provides wisdom and comfort to any of us who have experienced the loss of a much beloved pet. Balancing her own story with those shared by her readers, Hawn walks the reader through the painful process of loss from the early stages of grief through the memorials that help us heal. So many people struggling with their feelings ask themselves, ‘Am I alone in feeling this way?’ and ‘Will I ever get better?’ Heart Dog will assure them, with candor and compassion, the answers -- in order -- are "No" and "Yes." "When I lost my Heart Dog, luckily I had a few long-distance friends who knew what I was going through, and they were an immense help. If you’re experiencing the shock and devastation of losing your canine soul mate, and none of your friends and family seem to understand, Roxanne Hawn’s words in Heart Dog can be that long-distance friend that you need. Told from the vantage point of her own devastating grief, along with input from a survey of 500 others who’ve lost their heart dogs, the book helps you understand what to expect in the coming days, weeks, months and more as you slog through your grief and find your new normal. Heart Dog would make a great gift, for yourself or a loved one suffering the profound loss of a heart dog." "A hopeful, encouraging read. Heart Dog is like having your best friend put their arm around your shoulder and tell you everything’s going to be okay." "Roxanne’s experience mirrored so many of my own emotions I felt after losing my Maltese, Angel, nearly 20 years ago. Having had multiple dogs throughout my life, I really hadn’t considered any of them a Heart Dog until remembering my grief over Angel. I wish I had this book then." 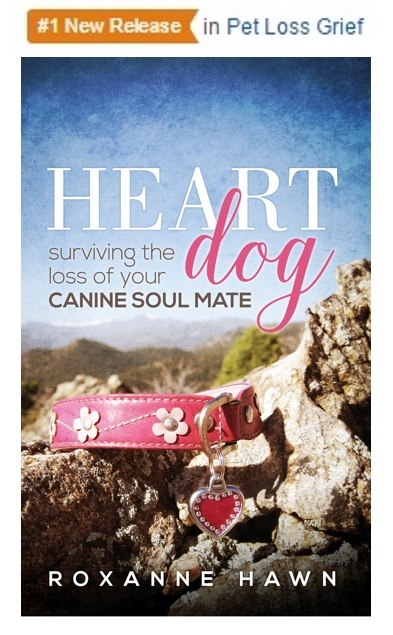 “Roxanne Hawn has written a poignant book that should appeal to anyone who has suffered significant loss in their life, in particular the death of their Heart Dog. Hawn relates her own experiences with severe grief, and personal struggles, following the death of her Heart Dog, Lilly. She offers the reader numerous valuable insights, along with thoughtful advice for understanding and trying to cope with such a momentous private hurt. As a veterinarian, I highly recommend this book to any member of the veterinary medical health care team, who would like to gain knowledge and understanding regarding the strong feelings and severe stresses, which their clients may undergo, following the loss of a beloved pet, specifically their Heart Dog. "When my Luna died after a chronic illness, I was more than devastated. Even though I knew it was inevitable, the loss was overwhelming. I was lost without her. I turned to Heart Dog: Surviving the Loss of Your Canine Soul Mate, where I found comfort in learning ways to mitigate the depths of my grief. This insightful book enabled me to grieve in a more healthful way, getting through the mourning roadblocks that so engulfed me. I would recommend it to everyone going through a loss." "Roxanne Hawn's gentle, supportive, and practical advice is one of the only things getting me through the agonizing recent loss of my own Heart Dog. She has written from the depth of her soul to help others experiencing this terrible grief and her wisdom, coupled with the extensive survey she did of others in this situation, has helped me know I am not alone and that there is a path out of the darkness. I'm reading parts of this deeply insightful book over and over as a lifeline." "I have lost my brother and my Heart Dog, Jasmine, a month apart. I confess that the loss of Jasmine struck me harder. I have witnessed the love and bond Roxanne and her Heart Dog, Lilly shared. I saw their struggles and her pain after Lilly's passing. Roxanne's book offers a beacon of light in the darkness of the terrible grief; a fully loaded first-aid kit for Heart Dog loss survival." Thank you, Paula. I’m forever changed by Lilly’s death. I hope she is at peace. Awww mom that is so sweet I love that and I love them to and you to mom. Love my Heart Dog. He is 14 year old Australian Shepherd red merle. I have his brother and i love them both so much. My red merle named Dundee is my heart dog. I have wondered to myself from time to time what makes the one a heart dog and the other one a dog i dearly love. You see they both mean so much to me and my love for both of them is profound. Except the one seems to connect up with me on a deeper level. Dundee has a constant concern about my well being. He loves me to the moon and back and he expresses this love for me everyday. ❤ Im so thankful for the dogs in my life.